In life, there's no better motivation to do something than knowing that your actions will benefit others, especially children in need. This is why, I always show full support towards causes that are going to help kids to have better lives. (L-R) UNICEF Celebrity Advocate for Children Anne Curtis, UNICEF Philippines Country Representative Lotta Sylwander and Coach Rio dela Cruz invite the public to join the Heroes for Children Run on September 4, 2016, Sunday, at the SM Mall of Asia grounds. Proceeds from the run will go to UNICEF’s First 1,000 Days campaign for children’s health and nutrition. Register online at www.runrio.com/HeroesforChildren until 19 August 2016. In-store registration is ongoing until 28 August 2016 at the following Chris Sports outlets: SM Mall of Asia, SM Megamall, SM City North Edsa, SM City BF Homes, Glorietta, Market! Market!, Robinsons Place Manila and UP Town Center (from August 15 to 28). The Heroes for Children Run 2016 is organized by Anne Curtis and co-presented by RunRio through the support of SM Mall of Asia, Cherry Mobile, Gatorade, Viva Artists Agency Incorporated, Toy Kingdom, Swatch,Eureka Home Appliances, Maynilad, Philippine Star, Good Housekeeping, Female Network, SM Cinemas, Nyxsys Philippines, Chris Sports, F1 Hotel & Resorts, Transprint Corporation, Microtel by Wyndham,Hisense/Devant, and Pacific Cross Insurance. 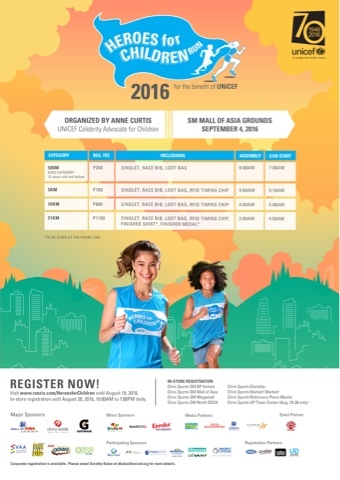 10 August 2016, Manila, Philippines – UNICEF Celebrity Advocate for Children Anne Curtis calls on runners to join the second year of the Heroes for Children Run on September 4, 2016, Sunday, at the SM Mall of Asia grounds. “For 70 years, UNICEF has worked to improve the lives of the most disadvantaged, vulnerable, and excluded children around the world. Despite the many gains, the lives and futures of millions of children are still in jeopardy. In the Philippines, one out of three children under the age of five suffersfrom chronic malnutrition—the effects of which can be permanent, irreversible and even fatal after two years of age. 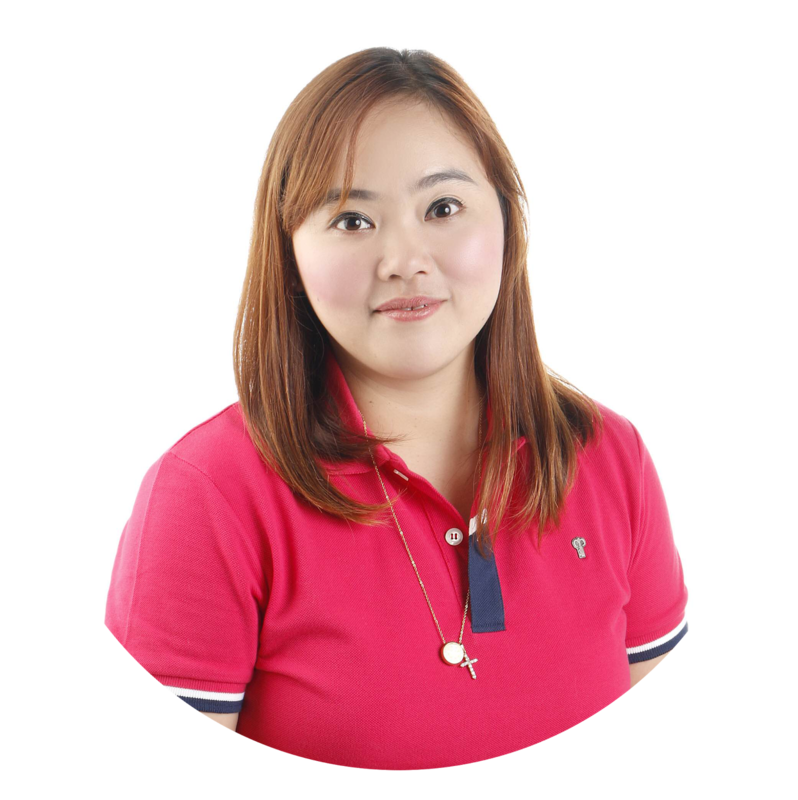 UNICEF believes every child should have a fair chance at life,” UNICEF Philippines Country Representative Lotta Sylwander says. The Heroes for Children Run 2016 is organized byAnne Curtis and co-presented by RunRio through the support of SM Mall of Asia, Cherry Mobile, Gatorade, Viva Artists Agency Incorporated, Toy Kingdom, Swatch, Eureka Home Appliances, Maynilad, Philippine Star, Good Housekeeping, Female Network, SM Cinemas, Nyxsys Philippines, Chris Sports, F1 Hotel & Resorts, Transprint Corporation, Microtel by Wyndham, Hisense/Devant, and Pacific Cross Insurance.